Thank You for visiting Army 6x6 LLC! If you are looking for the best truck for your money you have come to the right place. 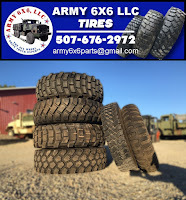 Army 6x6 LLC is owned by Jim & Andy Cox and is located in Owatonna, MN. We have owned Army 6x6's for over 13 years and enjoy driving and working the trucks as they were intended. We'll gladly provide references of numerous satisfied customers. Our sales philosophy has always always been treating customers how we would want to be treated. We have sold trucks as far West as Alaska and as far East as Sidney, Nova Scotia. We are very competitive with our shipping rates and have loading ramps on site. We offer EXPORTING for an additional charge. Designed by dan.mayfield@gmail.com. Powered by Blogger.